Today, September 29, is my birthday. Your blog is the BEST birthday present, one better than I could have ever asked for. Baptized on Easter Vigil, 2004, I am a mere toddler in the Catholic faith. Since, I have been showered with graces and every day has been one of discovery. Today I was exceptionally gifted when I found your blog via spiritdaily.com I think Archangels Michael, Gabriel and Rafael have something to do with my finding your blog. I share my birthday with the feast day of these wonderful angels. Perhaps it is their gift to me. I have learned so much from you about grace, sin, prayer, and Mother Teresa and St. Padre Pio, two people I was familiar with — and to whom I was inexplicably drawn to — before I even had the faintest inclination toward religion. 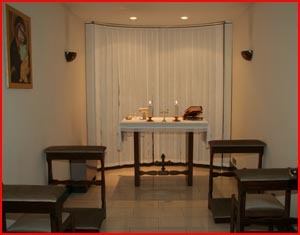 Your insights and thoughts on prayer and on the Mass, in particular, have opened my eyes and heart even wider. A wonderful way to begin my new year, don’t you think? I went to Rome in the 90s, but as a tourist and art history buff. Through your words, I return again, however vicariously, but this time as a faith-filled pilgrim. I will return here often to be infused by your words and to see Rome through the eyes of faith, yours. I want you to know how blessed I feel today, that I have met you through this incredible medium that can also be used for so much GOOD. Thank you and God bless you. Thank you sooo much for this wonderful blog. I have enjoyed immensely all your descriptions, words of encouragement. I feel like I am there and you are my host. Thanks for bringing “your world” to us so we can experience it. The photos have been fantastic and enjoyable as well. God will bless you for this work! I have so many new thoughts and prayers for you thanks to your great and humble sharing through the blog. Thanks for being so warm and outgoing. You, as my Metropolitan Cardinal Archbishop Sean, are my intention for this Saturday’s 4:00 Vigil. God bless you and keep you safe! 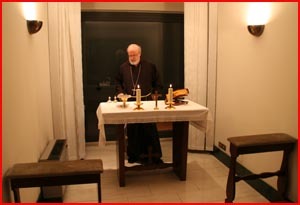 A handful of years ago, I prayed for our then Bishop Sean O’Malley at the tomb of Padre Pio at the San Giovanni Rotondo while on a parsih pilgrimage. I continue to this day to prayer for great blessings on you Cardinal Sean, who my family considers a true beacon of hope and love in these modern times. This blog is just one more example of your great respect and humble kindness. Thank you and all the best to you from here in the woods of southern New England. We don’t need “church speak” on blogs. Save that for sermons that we can sleep thru. Blogs are a different media. We need short, practical and even humorous posts, or heartfelt sermons (that don’t use jargon…) so those who merely want a quick look don’t have “my eyes glaze over” (MEGO) reactions and never return. For longer sermons and photos (I finally got broad band, but lots of people still have dial up) you might try to have a “continue here” after a few paragraphs, so those who want to read it can, and those who want to browse can ignore it. Thank you for sharing with all of us (in cyberspace) your experiences at the Vatican. The kindness and generosity you showed by letting us “inside” the lives of the Vatican is just amazing. 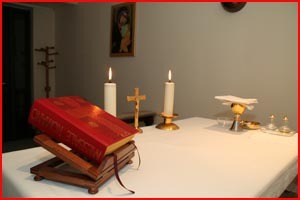 Thank you for placing your homilies as well, THEY ARE THE WORD OF GOD and our souls need that nurturing. Que Dios le bendiga siempre, le acompanamos en nuestras oraciones. Podra venir a Belgica? Thank you so much for such a beautiful story and pictures of Rome. I will keep you in my prayers. What a beautiful way to share such a beautiful place. work in Portland,Maine. Please keep your Blog,full time. God Bless,In St. Francis And St. Clare. The blog is beautifully done, and very informative. In these days when so much disturbing news about the Church and the clergy is being bantered about it is refreshing to find a highly placed pastor who takes time to show his human face to his people. I myself was educated by the Capuchins and the Jesuits, and I dearly respect you both. It was nice to see that you didn’t play too much into the sometimes jocular old rivalry between the two, and you were generous in your esteem and praise for both. So may you continue to enjoy Pax et Bonum while you work Ad Majorem Dei Gloriam. I’m a french girl, and it’s not easy for me to read your blog but it so beautiful.